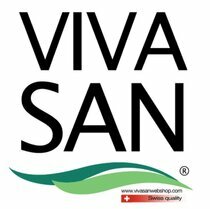 Newsletter with always super offers - Vivasan Webshop English - World wide delivery Vivasan Official Webshop® is specialized in shipments to the UK, Ireland and Scandinavian countries. Best prices! Vivasan webshop sends monthly a newsletter to interested customers. Sign up is possible through this form or at the end of an order. We call on you to sign up for the newsletter because we often have exclusive and attractive offers for our readers. Would you after receiving a newsletter prefer not longer to receive it, you can simply unsubscribe in one click.